If you missed the Halloween party, you really missed it! 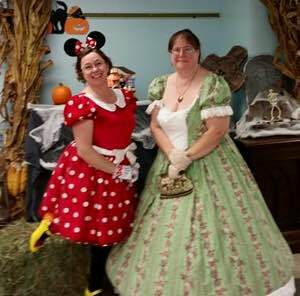 About 100 people and kids came mostly in costume; 25 of those being invited friends of the church! There were games for kids, games for adults and games for kids and adults. 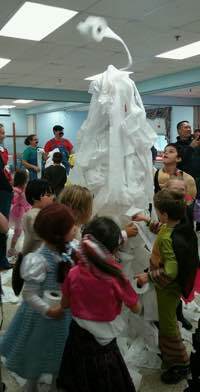 The kids enjoyed mummifying adults, as well as their own games of candy corn relay, pumpkin relay, while everyone enjoyed watching the adults getting gummy bear worms out of a whipped cream pie without hands, etc. During the kids’ games the adults had a chance to get to know one another. I (Pastor Todd) talked with a neighbor of a church member from Venezuela. The wife had been raised in a Catholic school and wanted religion for their kids, but the husband had not been raised in any faith. He asked me, “Does the church do any community service?” Just so happened that after our morning leadership session there were 63 different community agencies within which our church serves plastered all over the Upper Room walls. So I showed him. He was impressed. Jesus was honored. The event ended with a display of our carved pumpkins. If you missed the event, you may want to mark your calendars for next year–and bring a friend!